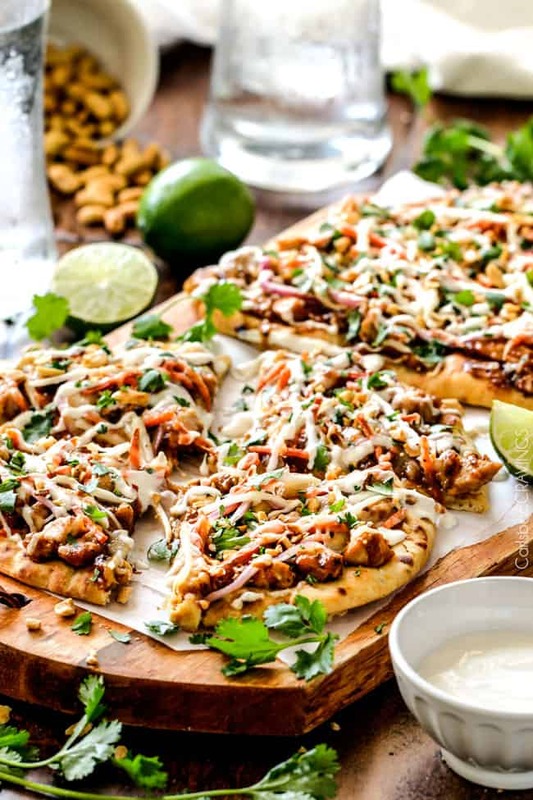 CPK inspired 25 Minute Thai Chicken Flatbread Pizza smothered in easy Asian peanut sauce, tender chicken, mozzarella cheese, crunchy carrots, sprouts and peanuts and the option of Coconut Crema drizzle – an amazing flavor bursting quick dinner or appetizer at a fraction of the cost! Oh how I love California Pizza Kitchen! My crush started when I was just a teenager and CPK was just a yellow and black checkered restaurant. It was our teenage hangout for all occasions that warranted a little longer or a little nicer nicer than the favorite In-N-Out. At CPK, our large, loud, bubbly group always ended up seated in the back corner. And somehow, I always ended up with the Thai Chicken Pizza. While CPK is known for their BBQ Chicken Pizza, which I do love, its their delectable Thai Chicken Pizza that has my heart. I find its refreshing Thai flavors and complimentary textures absolutely intoxicating. And now I am thrilled to share my version of CPK with you! so YOU too can love this pizza whenever your heart desires. This recipe makes 2 flatbread pizzas which I would say serves about 2-4. Two if you are like Patrick and me and we both NEED our very own pizza. So yeah, you should probably double or triple the recipe. To start, you simply saute your chicken, then whisk in your peanut sauce ingredients which is simple mixture of soy sauce, brown sugar, lime juice, ginger, garlic, basil and of course – peanut butter! This is a variation of the peanut sauce I use in all my Thai peanut dishes and every time I am amazed at how much flavor can come form so simple a sauce – and you will too! 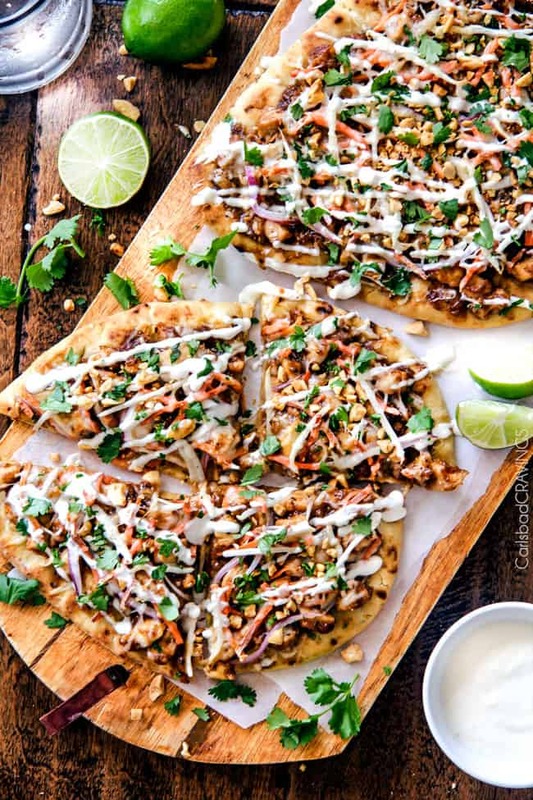 Spread this peanut chicken sauce onto your pizzas, pile with mozzarella cheese, red onions, carrots, bean sprouts then bake for 10-ish minutes until golden bubbly then garnish with cilantro, crushed peanuts and if you are feeling extra flirty and fun, drizzle it with 4 ingredient Cconut Yogurt Crema! Trust me, you want to feel extra flirty and fun. Hey there Ken, this looks scrumptious! We used to go to CPK for the Tandoori Chicken pizza with the mango chutney. Why they took that off the menu is beyond me… anyways. Fantastic seeing you this past weekend and look forward to seeing you two soon sometime. How did I miss the Tandoori Chicken AND with Mango Chutney – that sound incredible?! You might have to recreate the recipe if you haven’t already – I would make it all the time! And yes, fantastic meeting you this weekend! I hope Nagi really does plan an Australian retreat! but thankfully we live close enough we don’t have to wait for that! Have a great weekend! Hi Jen! When I go CPK, Thai Chicken Pizza is the one I usually order, but I don’t remember when was the last time I went there… I made this tonight, and it was delicious even though I forgot to add cheese!! Half way through eating, I noticed, and I sprinkled the cheese to those who were still eating pizza. What kind of person who forgets cheese for pizza! Oh, well. Next time, I won’t forget, and it will taste even better! I made the homemade pizza crust, but next time I would like to try naan, especially when I don’t have time, it will be nice. Hi Keiko, I am so glad you liked these – even without cheese 🙂 but I agree, it will be even better with cheese next time! And you are amazing to also make the homemade crust – but yes, I love naan for when I am short on time – or just lazy and it still tastes great :). and I love that you also order the Thai Pizza at CPK – we definitely have the same foodie tastes! 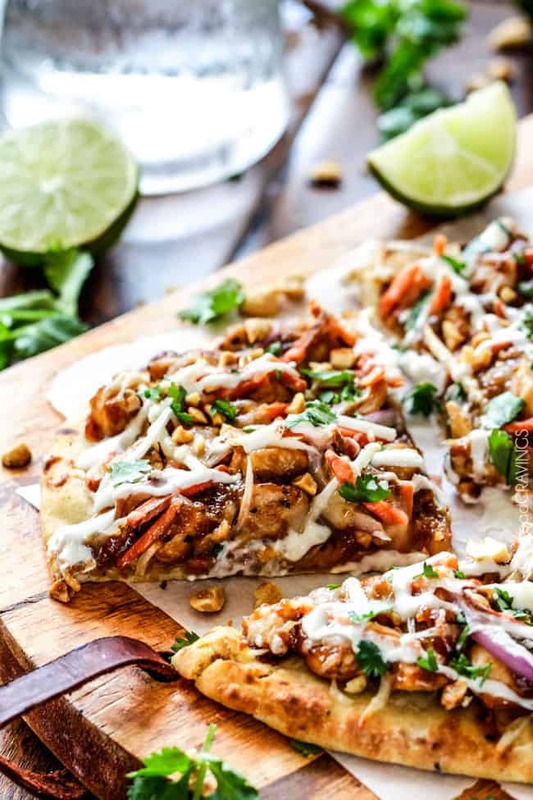 I have always loved Thai pizza so I was super excited to make this – it did not disappoint! Seriously, so good and easy I will be making it all the time! thanks Jen! You are so welcome! I am thrilled it “did not disappoint!” Thanks Lindsay! I often make mini-pizzas with pita bread. I think this would work perfectly with that! I’m always on the lookout for new combinations for my pizzas! 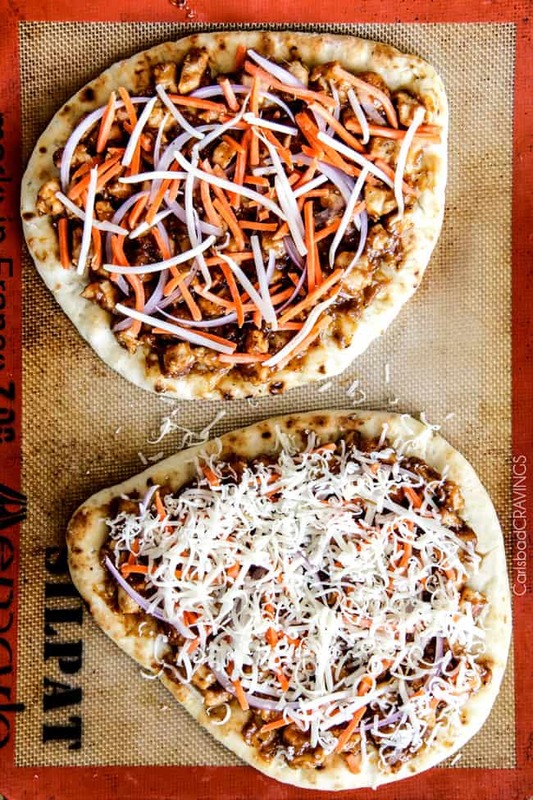 I love the idea of making pizzas with pita bread! Pizzas with any sort of flatbread are just so easy and yummy, such a great quick dinner. I hope you and your family love these. Thanks Melissa! OMG. I LOVE Thailand and I LOVE Thai food. This has got to be the best compilation of recipes I’ve seen in quite awhile. Keep up the good work! Thank you so much Brooke! If you love Thai food, I think you will love this pizza! Enjoy!!! My family loved these flatbreads! I used homemade Naan bread and shredded carrots (instead of matchsticks). I didn’t have the ingredients for the coconut crema, so I cooked the chicken in coconut oil to get a wee bit of that wonderful coconut flavor. Thanks for a terrific recipe I will be making again. Hi Jocelyn, so happy your family loved these flatbread pizzas and your homemade naan sounds DIVINE – what a way to take it over the edge! Thank you! Hope you love it! Thanks Simon! Jen, I made this and almost died. My boyfriend and I feasted on these pizzas for lunch at work every day following! What an absolutely delicious recipe. I didn’t have any bean sprouts or red onion on hand so I skipped those, but it was still great. Thanks for the recipe! YAY! not for the almost dying part but for the loving them so much part :)! Thank you so much Cassie for making my day!! Haha, dying in a good way! (If that’s possible? :P) You’re welcome! Jen, I love peanut sauce, but my daughter is allergic to nuts. If I substitute soy butter for peanut butter, will it still be tasty? Thanks! Hi Lori, I have never tried soy butter so I honestly don’t know – sorry! This was truly fantastic! I loved the variance of flavors and textures. I made it for a dinner party and every single person raved. Thanks for another amazing recipe! YAY! I love it when people rave and what a fun menu item for a dinner party, so happy everyone loved it! Thank you Julie! This was either the fifth or sixth recipe of yours I’ve made and just like all the others it doesn’t disappoint and like the others it gets rave reviews from my family. 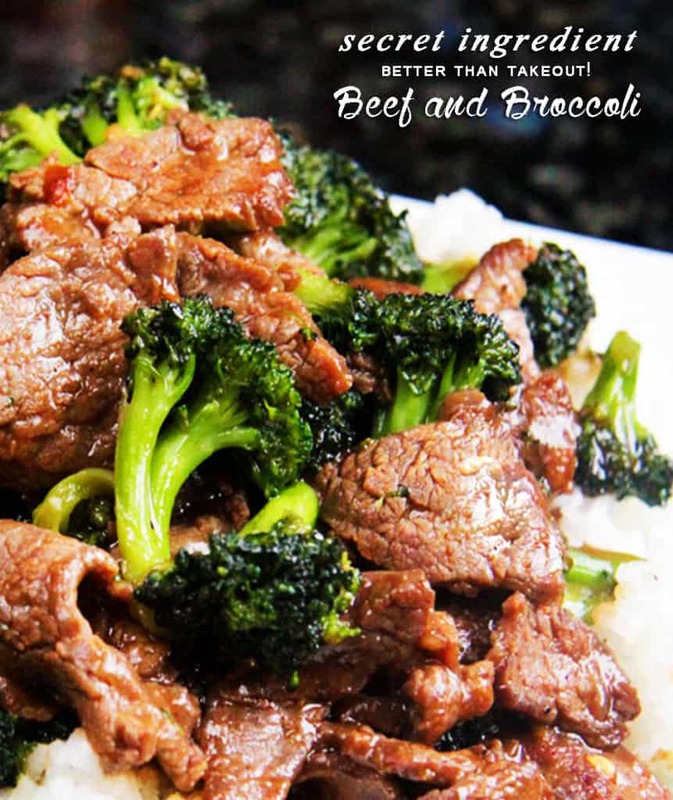 From the moment I found the Carlsbad Cravings website, i haven’t thought about going anywhere else to find something new for dinner. 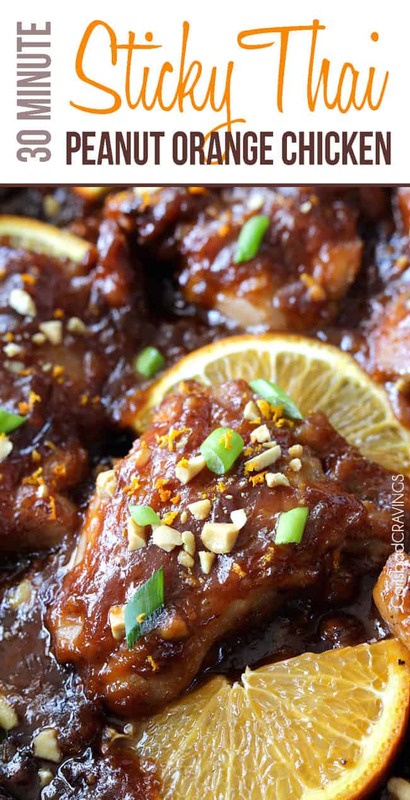 We love Asian dishes so these recipes have been the ones we gravitated to immediately. Thank you, Jen for these delicious meals! I brag about CC all the time.